Grab News on the Go? Sure. Pay? Nope. Nearly half of all adult Americans use their mobile devices to get local news and information, but only 1 percent of grown-ups pay for the privilege, according to a new study by the Pew Internet and American Life Project. The recent survey of 2251 American adults also found only 11 percent of people access local news through a mobile app. Presumably, users opt to use the mobile Web and text alerts instead. The Pew study calls this preference for app alternatives the "app gap." The study considers mobile devices to be both tablets such as the recently launched iPad 2 as well as cell phones. 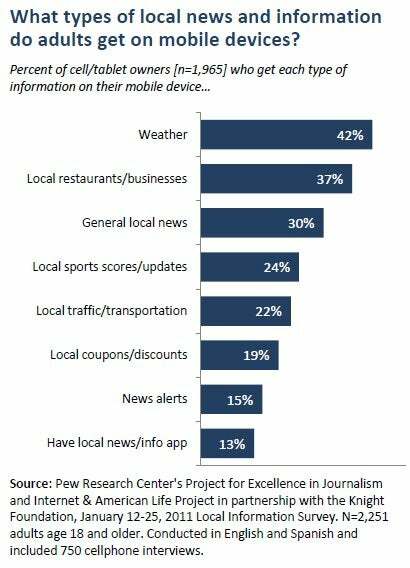 The study -- done in conjunction with the Pew Research Center's Project for Excellence in Journalism and the Knight Foundation -- finds that weather updates are the primary draw for local information for about 36 percent of all American adults (42 percent of mobile device owners). Local restaurant and business information was the next most sought-after category, followed by general local news, sports scores, and traffic. Despite the high interest in getting local information via mobile devices, not many people appear to be interested in paying for it with subscriptions or flat fees. Only 10 percent of adults using mobile apps to get local information pay for the privilege. 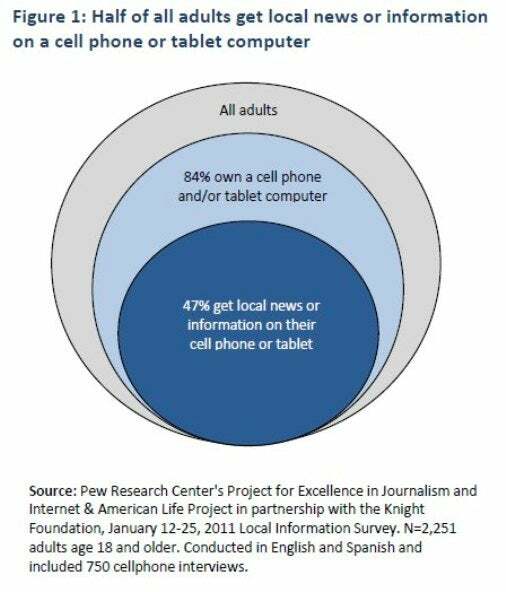 The Pew study says that means only 1 percent of people overall are paying for local news on mobile devices. But those findings don't necessarily mean people aren't willing to pay for local news. The study also finds that 36 percent of adults pay for local news, the majority preferring the local newspaper to a mobile app or other local news content. Some hope remains, however, for local news organizations hoping to make money from paid mobile apps. The study finds that 38 percent of people using local mobile news apps would be willing to pay as much as $5 per month to access their local newspaper online. And 24 percent would be willing to pay as much as $10 per month. The downside is this works out to just 23 and 18 percent of all American adults for each respective monthly fee. So who's driving the move towards (mostly free) mobile local news? Turns out they tend to be people who are young, affluent, highly educated, and living in cities or suburbs, and are predominately new to their community, according to the Pew study. About 70 percent of American adults between the ages of 18 and 29 are consuming local news on mobile devices, and 63 percent between the ages of 30 and 49 are doing the same. Among those owning cell phones or tablets and making at least $75,000 per year, 70 percent are checking their mobile devices for local information compared to 54 percent of mobile device owners in lower income brackets. Mobile local news consumers also appear to feel more empowered by accessing news on the go. The Pew study says 35 percent of people receiving local news on mobile devices believe they can have a big impact on their community. About 27 percent of those who don't access local information on the go feel the same way. About 75 percent of mobile local news users are on a social network, but only 15 percent are on Twitter. And 51 percent say they use six or more different platforms or sources to access local news and information such as newspapers, television, radio and the Web. Local mobile news appears to be a bit of a mess right now. Nearly half of American adults (47 percent) are accessing local information on mobile devices, but only a small number of people are willing to pay for it. But at the same time, 36 percent of adults are paying for local news, just not on their mobile devices. Perhaps it's only a matter of time until more people move from paying for local newspapers to paying for mobile apps and digital subscriptions.